Kate Winslet may have chosen an unconventional first name when she decided to name her newborn son Bear, but when it came to the boy's last name, she wasn't messing around. The Oscar winner, 38, married Ned RocknRoll in December of 2012 and having the baby - who was born three weeks ago - take his last name was never an option. "It was always going to have my name," she told Glamour U.K., on newsstands now. "Of course we're not going to call it RocknRoll. People might judge all they like, but I am a f*****g grown-up." Winslet, who was previously married twice and has two children Mia, 13, and Joe, 8, from those relationships, says she feels "so incredibly lucky with this new chapter," but that she is being guarded this time around with Ned, as "there are hardly any pictures [in the press] of us together." She's so protective of her privacy now, that "if I'm having a private conversation, I'll say, 'Don't tell me over the phone.'" 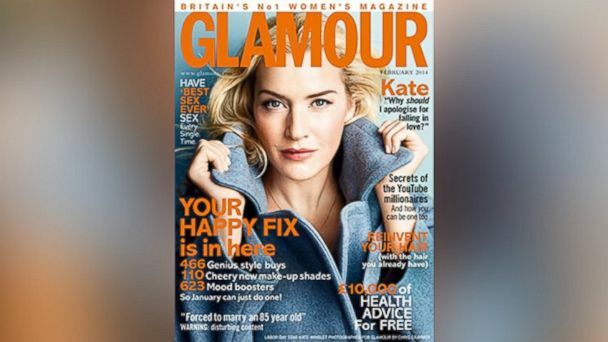 Aside from multiple Oscar nominations and being the face of Lancome, Winslet insists she's a normal gal. "I don't think I'm special at all," she said. "The reality is I absolutely love my little life - which is, away from all the other stuff, a little life. I trundle along; we have friends over; I make dinner. It's weird, because the two worlds are so different: from fishfingers for tea to film sets. But that's the case for any actress who's a mother." She adds that she could have drivers and hire people to cook food for her children, but "I wouldn't want my children raised that way." Though she may have gotten some flack when she got married and became pregnant for a third time, Winslet said she is as happy as she's ever been. "The lovely thing for me is that I don't have to say what's happened in my life that has taken me down this path," she said. "I just can't even begin to tell you how lucky I am that I suddenly feel I've got something wonderful." Having just finished her latest film "Labor Day," the actress said now she plans to solely focus on family. "And it's Ned's first baby - I can't wait for that bit, actually," she added. She's excited to give her kids "that childhood like I had, where you climb trees and graze your knee … My life is not the soap opera people would like it to be: in fact, it's not a soap opera at all."